As a 75 year-old Buenos Aires born man fútbol is supposed to be in my blood. 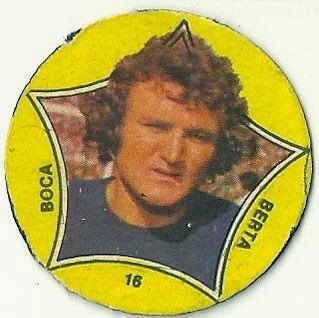 By the time I was 8 or 9 I was playing with the circular figuritas or estampitas that featured players from the professional football clubs of Buenos Aires and the provinces. We played a game with them. We would throw them to the edge between the sidewalk and the house walls. The owner of the estampita’s that was the closest to that edge would win all of them. Or we traded one of these for four of those when the player was especially famous and valuable. My neighbours were fans (called hinchas in Argentine Spanish) of Club Atlético Boca Juniors and fanatically followed the loud speeches of General Juan Domingo Perón and his wife Eva Duarte de Perón. The radio was played loud and my father cringed. Because we were snobs of English origin, fútbol was the sport of the lowly masses and we followed the more “elegant” rugby particularly since my first cousin Rollo Barber played for the Club Atlético San Isidro as still do his cousins, nephews and grand-nephews. But I do remember my father taking me to one Buenos Aires classic, Club Atlético River Plate against Boca Juniors. The best part of the match was drinking the ice cold chocolate milk Vascolet. Once we moved to Mexico City my mother was the fútbol fan particularly when the Argentine selección would come to town to play the Mexican side. Invariably the Argentines would lose and they would blame the city altitude. My mother called the Mexican sports announcers “buitres” (vultures) as they were obviously partisan. In the middle 60s when I was a conscript in the Argentine Navy one of the few privileges of the uniform is that I could go to any fútbol game for free as long as I wore my uniform. In that uniform I saw Pelé at his best when he played for Santos. But by the 60s the fans of the sport had deteriorated the conditions of going to a game. Women were not to be seen anywhere. Cans and bottles were banned so those in the upper stands would piss into paper cups and pour the contents down on the fans below. The boundary between the standing only cheap places and the rest of the stadium was a tall metal fence with spikes at the top. Going down the spiral ramp of the River Plate Stadium (the largest) was an excruciating experience as one would walk on inches of urine. Fans would piss on the wall. I remember being on a colectivo (bus) on my way to the Boca Juniors bombonera (stadium) for a River/Boca classic. From the bus I could hear a loud roar. The game had already begun and half of the stadium was loudly screaming at the referee, “Hijo de puta, hijo de puta!” (son of a whore). Now in this century the previous president of Argentina to Presidente Macri (who at one time was the director of Boca Juniors) Cristina Kirchner, by presidential decree, banned the fans of Boca from going to River Plate Stadium and vice versa. What is strange is that across the charco (pond) that is the River Plate, football matches in Uruguay are perfectly civilized. I can now report that somehow my two daughters (both born in Mexico City) Alexandra and Hilary are fans of fúbol and have been avidly watching the world cup. I cannot bear to watch the final today as Ale keeps me posted and we are depressed that Croatia is losing. But there is one thing that makes me smile. Somehow Ale watching the game on TV reminds me of my mother. It would be my mother who would remind her that up to 1970 the trophy cup was called Jules Rimet.